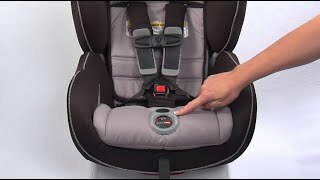 Whether installing with lower LATCH connectors or the vehicle seat belt, most of us consider car seat installation to be a bit of a struggle and we are often left wondering “did I do it right?” But with the revolutionary ClickTight Installation System, you can install your child’s Convertible Car Seat using the vehicle seat belt and get a safe, secure and easy installation every time – whether rear- or forward-facing. ClickTight Key: Located in the lower seating area of the car seat, the ClickTight Key unlocks the front panel to reveal the belt path. ClickTight Tensioning Mechanism: The all-steel tubing lining the inside of the front panel joins with the steel frame to both tension and lock the seat belt at the same time. 3 out of 4 car seats are installed incorrectly. An improperly installed car seat can leave your child vulnerable to injury in the event of a crash so, as the leader in safety technology, we worked to develop the revolutionary ClickTight Installation System. ClickTight allows you to easily achieve a safe and secure car seat installation every time. LATCH has weight limits. Convertible Car Seats are being made with higher weight capacities than ever before. This is great because according to the AAP, your child should ride in a 5-pt harness for as long as possible. The downside is that installing your car seat using the lower anchor (LATCH) system has limitations as your child gets bigger. When the combined weight of your child and car seat is 60 pounds or more for rear-facing car seats and 65 pounds or more for forward-facing car seats, you must install the car seat using the vehicle seat belt instead of the lower anchor (LATCH) system. ClickTight uses the vehicle seat belt to achieve a safe and secure installation every time so you don’t have to worry about the limitations of LATCH. Effortless installation. ClickTight allows you to achieve a safe install without all the effort – no shoving, kneeing or yanking required. ClickTight does all the work for you. The unique combination of an extremely simple yet secure installation allows you to install with real confidence every time. 1. Turn the ClickTight Key to Open 2. Thread and Connect the Vehicle Seat Belt 3. Click it Closed! Britax recommends that the top tether be used at all time when installing the child seat. *May not be compatible with all vehicles; see user guide for installation instructions. Click on the video below for more information and details on the ClickTight Installation.